As I mentioned in my previous post, I have opened a tiiiny Etsy shop to re-sell a few Japanese sewing notions. Let me praise these products and explain to you why I use them. Amongst all of the brands of hand-sewing needles in Japan, I went for this one because my teacher at ESMOD recommended them. So like a good student, I followed her advice and was not disappointed. Extra thin and sharp, these needles do the job: they penetrate easily through multiple layers of fabric; they go through coating wool or silks like a hot knife through butter and transform hand-sewing into a more enjoyable experience. A good thimble can be helpful, though, as the needles are really thin and sharp. My ESMOD teacher also told me that this cotton thread is ideal for basting! When we temporarily put two or more layers of fabric together, we baste them by machine or by hand. Nothing against machine basting! But after machine basting, I find it more difficult to remove the thread and control what I am doing. I manage my fabric better when basting it by hand and, because the cotton thread breaks much more easily than polyester, I can remove it in the blink of an eye. If your seam is very long, just snip it every couple of centimeters/inches and voilà! Another important use of this thread is for making tailor tacks. And yes, Ayumi-sensei also taught me this :) Two years ago, when I had just started at ESMOD, we used tailor tacks even for skirts! So not only for tailoring! Wondering what a tailor tack is? It's a way of marking fabric using only thread; avoiding pins, chalk or other markers on the fabric. A tailor tack looks like a loop. In fact, this can be a topic for another post! 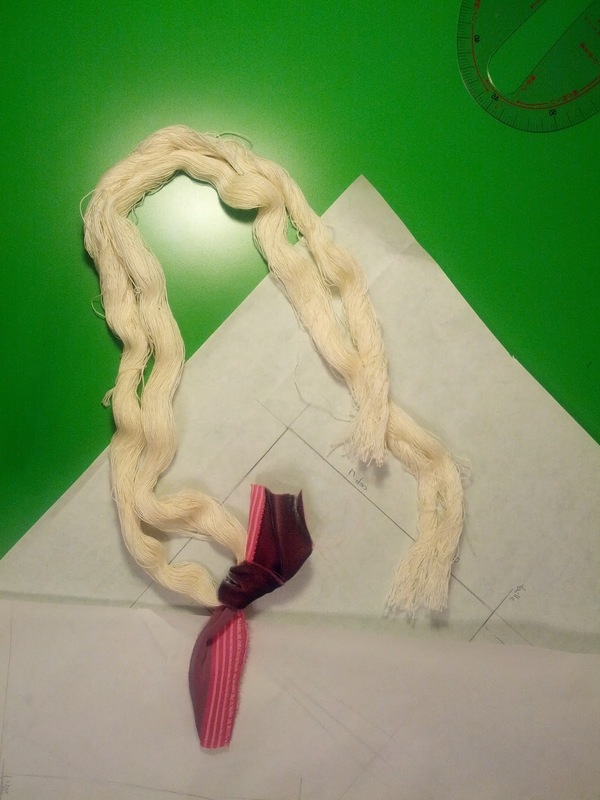 A tip for the best use and maintenance of the cotton thread: Knot a piece of contrasting thread or ribbon across the entire bundle of threads. Then cut through all of the threads, opposite from the knot as shown below. Keeping your basting thread this way will allow you to easily pull individual strings of thread and keep it together at the same time. In the construction and assembly of my woolen skirt and the Matthew Williamson dress (still unfinished), I used silk thread for both basting and sewing. From your own experience, you might know that when pressing/ironing some very sensitive fabrics like wool or silk, seams leave marks on the right side of the fabric. To prevent this from happening, use silk thread for basting. Oh boy, this woolen skirt required lots and lots of pressing and none of the basting thread marks could be seen. I even experimented with different types of thread and then tried to press it. Unfortunately, no photos was taken, but you can take my word for it. In my Etsy shop, I currently sell only N4 silk thread. If I am not mistaken, it's the finest you can find. The following number is N9 and the thread is thicker by a fraction of a millimeter. The reason I am selling only N4 is because I've used it myself. For my next couture project I'll try N9 and only after testing it will I recommend it to other seamstresses. I used this silk thread to put the skirt together, considering that it was done mostly by hand. Despite being so thin, the silk thread is very strong. But before I start sewing, I pass a piece of silk thread through a piece of wax and iron it once or twice. By doing this, the wax settles within the thread and makes it stronger, preventing the thread from twisting. Are there other Japanese sewing notions which you are interested in and would like to see in my shop? Japanese sewing notions really are amaing quality... even the basic Yuzawaya thread is noticably smoother and less fluffy than the Guterman I buy in Canada! Wow, these are so cool! Heading over to your shop now! I'm looking forward to receiving them :) I was wondering how that fabulous Matthew Williamson dress was going! Very much looking forward to seeing the end result of all that hard work and Susan Khalje goodness. You're a star for sharing these goodies with us - especially as I can't get anything like this at home! pocket. The school or university should have what is called the Commission on Accreditation in Physical Therapy Education (CAPTE). So cool you now have a shop. I love gadgets and I feel Japan is way ahead in terms of notions. I was curious about that curve measure wheel...but I don't know if it's practical in the end. I would say...if you see any cool and useful gadgets not sold elsewhere it's probably a good choice! Japanese notions are so good because the companies that produce them had been doing it literally for centuries. 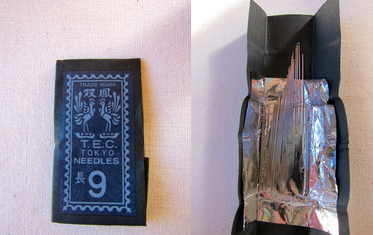 Currently, I've ordered a brand of hand-sewing needles from a house which had been established 350 years ago! Eager to introduce them to the sewing aficcionados after a trial! Thanks for the suggestion, but I am not quite sure about this measure wheel. Do you mind sending me an image of this gadget?